Discover bold clarity and breathtaking beauty in every one of the ruby engagement rings available here at Diamond Boutique. Possessing a warmth that can vary from pink to blood red, rubies are a popular choice for those looking for jewellery that demands attention. One of the four precious stones, this gem not only intrigues and entices, but personifies romance. Explore our collection and you’re bound to discover the perfect ruby engagement ring. 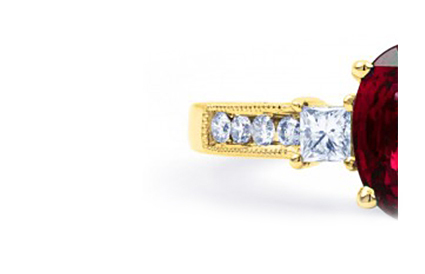 Offered in both yellow and white gold settings, we have a variety of designs on offer. Alternatively, you can custom design your own. Contact us on +44 (0) 203 6959 885 for more details.